Insect (Japanese: 昆（こん）虫（ちゅう） Konchū) monsters are a versatile, and somewhat well-supported Type of Monster that go hand-in-hand with Plant-Type monsters. The common attributes associated with them are EARTH and WIND. They typically act like their namesake by swarming the field, and can sometimes prove to be quite an annoyance to players by using their unique abilities. There are not many extremely powerful high-level Insects besides "Perfectly Ultimate Great Moth" (which is typically considered too much of a chore to summon), but at lower Levels, Insects can completely dominate the field, due to the high ATK their lower-Level monsters often have for their Level as well as their ease in summoning. 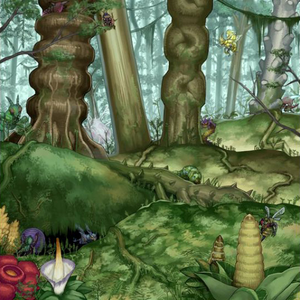 The list of support cards for this Type include: "Verdant Sanctuary", "Pinch Hopper", "Insect Imitation", and "Gigaplant". 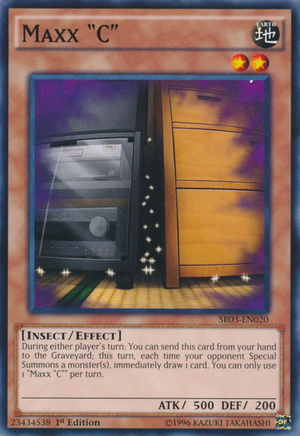 Insect cards are most notably played by Weevil Underwood, Missy, Lenny, Roman Goodwin, Jesse Anderson, Kyoji Yagumo, and Shinji Weber. Notable Insect-Type monsters include: "Aztekipede, the Worm Warrior", "Brain Crusher", "Chainsaw Insect", "Doom Dozer", "Earthbound Immortal Uru", "Flying Kamakiri #1", "Grasschopper", "Insect Queen", "Magical Merchant", "Man-Eater Bug", "Maxx "C"", "Metal Armored Bug", "Needle Worm", "Neo-Spacian Flare Scarab", "Number 20: Giga-Brilliant", "Number 66: Master Key Beetle", "Pinch Hopper", "Inzektor Exa-Beetle" and "Ultimate Insect LV7"
Insects of this deck are going to swarm your field and are going to maintain hand advantage at all times. The main cards of this deck are "Solidarity" and "Verdant Sanctuary". Playing 2 of each of these cards on your side of the field should give you victory (unless they are destroyed). The key focus of this deck is to get plenty of Insects in your Graveyard for two reasons: to use "Solidarity" and to get multiple "Doom Dozers" and "Aztekipede, the Worm Warriors" out on the field. If you ever get 3 "Solidarity" face-up on the field your "Doom Dozer" will have 5200 ATK! Even your weakest Monsters, like "Bee List Soldier", will have 2900 ATK! But to put things into perspective, you will probably only get a maximum of 2 "Solidarity" per game. This still means that your "Aztekipedes" have 2700 or 3500 ATK and can destroy almost anything. "Solidarity" is great when used with "Cross-Sword Beetle". He has the pierce effect which allows you to inflict damage while a Monster is in Defense Position. Insects themselves boast a large number of high-ATK, low level monsters, most notably "Insect Knight", "Neo Bug", "Arsenal Bug", and "Chainsaw Insect", all of which have outstanding attack power for non-tribute Monsters. "Doom Dozer" and "Aztekipede, the Worm Warrior" can also help in this respect as they can be summoned with little effort late in the game. "Grasschopper" is also a very good beatstick, as it can be Special Summoned by offering a level 4 Monster for "Insect Imitation" and (once it is Normal Summoned to gain its effect) can attack all Monsters on your opponent's field. "Saber Beetle" is useful in this deck both for it's high ATK and piercing effect. "Millennium Scorpion" is also a good choice both because it can be Summoned in the same way as "Grasschopper" and for the fact that it can gain substantial ATK when it destroys opposing Monsters. When "Grasschopper" gains its "Ultimate Tyranno" effect, "Cross-Sword Beetle" may help your insects deal more damage though piercing. "Insect Imitation" is important in this deck as it can bring out "Grasschopper" and "Millennium Scorpion" very quickly. Also, only include "Insect Princess" if you include "Parasite Paracide" as "Insect Princess" has lackluster ATK compared to the other beatdown cards unless you can change the Type of your opponent's monsters and the tribute would be better used for "Grasschopper". Because of the fair amount of Normal Monsters and "Grasschopper" being a Gemini Monster, one copy of "Dark Factory of Mass Production" is recommended but no more than 1 to prevent a dead draw. The best Field Spell Card for an Insect Beatdown Deck is "Gaia Power" because the most important Cards for Insect Beatdowns are EARTH-attribute Monsters, such as "Doom Dozer", "Grasschopper", and "Insect Knight". This deck focuses on "Insect Queen" and "Insect Princess's" effects, which boost their ATK points while there are Insects on the field. If you choose to use "Insect Queen", "Cockroach Knight" will be a great asset as will "Multiplication of Ants". This deck focuses on hampering your opponent's monsters by turning them into Insects, which can greatly hamper the efforts of type-specific decks. As expected, "Parasite Paracide" is crucial in this deck and three copies should be included. "Mask of Restrict" can help keep "Parasite" on the field since your only tribute monsters can be Summoned through other means (however, you will be unable to tribute any monsters for "Insect Queen's" effect, making her unable to attack as long as "Mask of Restrict" is on the field). "DNA Surgery" can also help in turning opposing monsters into Insects should you choose not to use "Paracide" (due to it's usefulness for Synchro Summons). Because your opponent's monsters will be Insects as well, "Insect Barrier" will be useful in this deck as it will prevent your opponent's monsters from attacking, hence allowing you to stall and protect your tribute fodder. "Ojama Trio" is also useful for providing additional monsters on your opponent's side of the field to either boost the ATK of "Insect Queen", or as "food" for "Insect Princess". "Light of Intervention" is also useful because it allows "Parasite" to do its work and to prevent nasty surprises. "Pinch Hopper" is also crucial as it can help summon "Insect Princess" and "Insect Queen" quickly. All three searcher/recruiter monsters should also be included to provide "food" for "Insect Queen" or to maintain field presence. You can also use "Gigaplant" together with "Skull-Mark Ladybug" in this deck, as "Gigaplant" will Special Summon the "Skull-Mark Ladybug" every turn, allowing your "Insect Queen" to tribute it, giving you 1000 life points every turn and also supplying your "Insect Queen" with free fodder. "Aztekipede, the Worm Warrior" is also helpful due to its ability to Special Summon itself thus providing quick tribute fodder and overall attack power. This page was last edited on 13 April 2019, at 08:49.